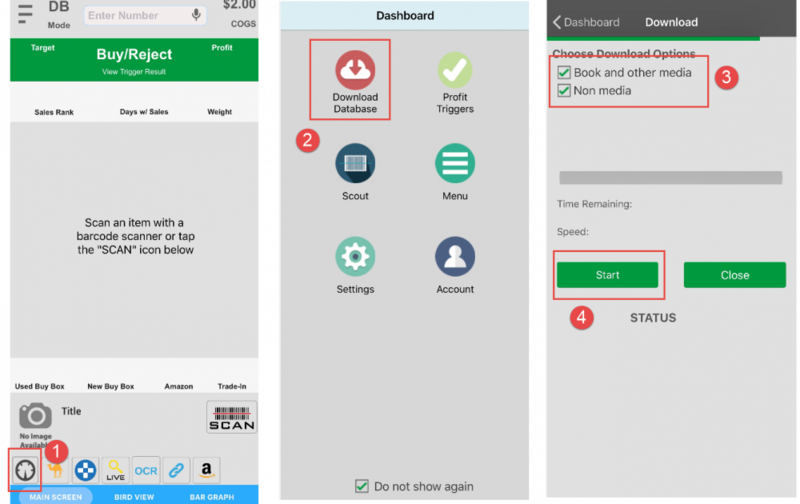 If you want to scan items very quickly, you need to download the database onto your phone, which is available in Professional Plans. This will allow the app to check the price without having to access the Internet, then return the information in less than a second. When you use the database, barcode scanner, and audio cue all together, you can quickly go through the items with much less work. *We recommend you download the database the night before you go out scouting, so you can have more accurate data. There are two ways to access the download screen: from dashboard or menu. Access the download screen from the dashboard. Tap Dashboard icon (1) from the main screen. Select download options. If you only sell books, then select Book and other media. Tap the Start button (4). Keep the download screen on until the download is complete. Access the download screen from the Menu. 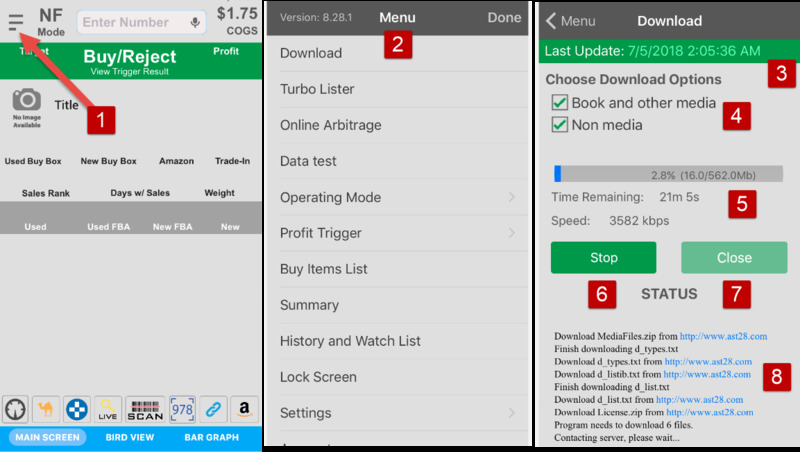 On the download screen, (3) is the creation time of the current database on your phone. You can choose to download the media and/or the non-media database (4). The progress bar (5) shows you the download progress, estimated time to finish, and current download speed. If it takes longer than the screen is showing here, run Google’s Internet speed test* and contact your Internet provider if your Internet speed is too slow. You can tap the Start/Stop button (6) at any time to start or stop the download. After the download finishes, tap the Close button (7) to go back to the main screen. Download status is displayed at (8). * Keep the download screen open. Do not to use a cellular connection, as the database size can be over 2 GB. During the download, do not turn on or off the Bluetooth scanner. 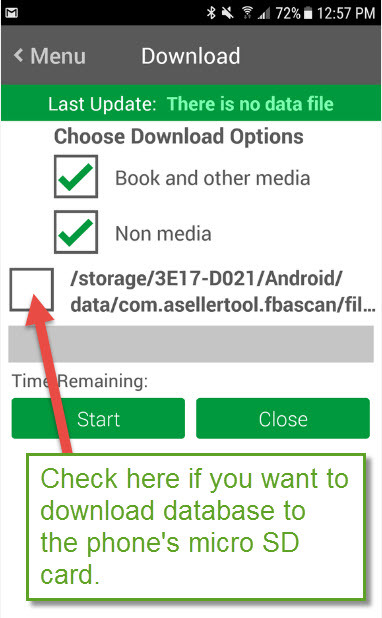 * If your phone has a micro SD card in it, you can also choose to download the database to it. Please note the SD card is not as reliable as phone’s internal memory. We recommend you always have a backup micro SD card with the older database, so you can switch to it if the current card gives you problem.